Since President-Elect Donald Trump was elected over Democrat nominee Hillary Clinton, the mainstream media have used alleged hate crime reports to drum up hysteria over issues like Islamophobia, homophobia, immigration, and race relations. The mainstream media has refused to mention that hate crime allegations carry an increasing possibility of being faked in an era of social media fame and reactionary crowdfunding, as evidenced in a recent report by Breitbart Tech Editor Milo Yiannopoulos, which found that more than 100 hoaxed hate crimes had occurred just in the last decade. Breitbart Texas has compiled a list of some of the most recent hate hoaxes that have occurred around the 2016 Election. After a Muslim student at the University of Louisiana at Lafayette (ULL) claimed that her hijab and wallet were stolen by two President-Elect Donald Trump supporters, police announced the claim was fabricated. Two Williams College students are now facing disciplinary action after hoaxing vandalism which appeared to be Ku Klux Klan inspired days after the 2016 Election. A black, female Bowling Green State University student allegedly fabricated a hate crime story about white, male President-Elect Donald Trump supporters attacking her on campus and is now being charged for faking a police report. Another student at Bowling Green State University (BGSU) has hoaxed a racist hate crime attack, local police have confirmed. A North Park University student fabricated a story where she claimed that President-Elect Donald Trump supporters had sent her “hateful” notes and emails following the 2016 Election, local police confirmed. After the Mississippi NAACP made accusations that a black high school student had a noose thrown around his neck by white students, others are now speaking out refuting the broad claims of racism. A woman who posted to her Facebook page that she had been sexually assaulted actually fabricated the story because she was “distraught over the recent election,” police confirmed. On Thursday, a Muslim woman in New York City claimed she was attacked by a white male who called her a terrorist and slashed her cheek with a knife before running away. On Friday, police announced the as-yet unnamed 20-year-old slashed her own cheek, giving herself a two-inch cut, and invented the hate crime story. On March 3, a transgender student at a California middle school claimed he was attacked, beaten, and sexually molested by other students in a school bathroom. Only a day later the student admitted that the claimed attack never happened. The Council on American Islamic Relations (CAIR)–a group founded by members of the Muslim Brotherhood and designated as a terrorist organization in the UAE–is concerned that damage to a Manassas, VA mosque’s air conditioning unit is a result of a possible anti-Muslim “bias motive,” the group said in two separate press releases from its national branch this week. Popular homosexual YouTuber Calum McSwiggan reportedly faked an alleged hate crime attack on himself in West Hollywood on Monday, according to the Los Angeles County Sheriff’s Department. Three women accused of falsely claiming they were victims of racial abuse and physical assault have been expelled from Albany University and will now face criminal charges. Two Muslim youths were injured outside a New York mosque, but police have rejected the incident as a “bias crime” because the two were slammed by a man after they harassed his girlfriend, officials say. An African-American man in Malden, Massachusetts has now admitted that he fabricated a hate crime report when he claimed two white men accosted him, saying the U.S. is now “Trump country,” and threatened to lynch him. An arrest was announced at 6 p.m. Monday night at the Houston Fire Department Arson Headquarters in connection with the February 13th Quba Islamic Institute fire. Darryl Ferguson, age 55 of Houston, has been charged with arson. 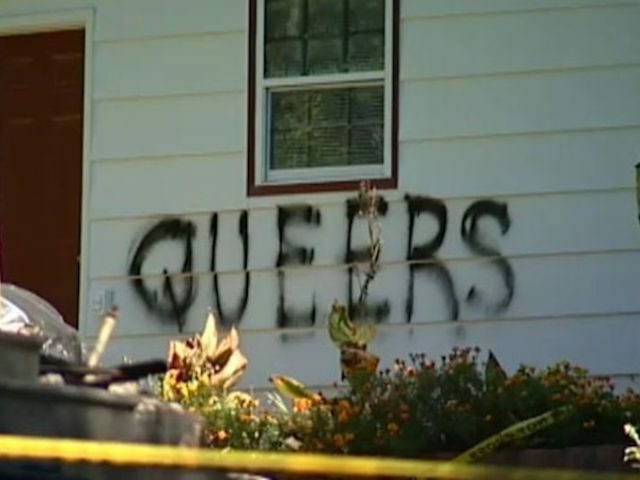 It appears the fire is not a hate crime. Ferguson told reporters at the police station that he was just trying to keep warm and the fire was an accident.